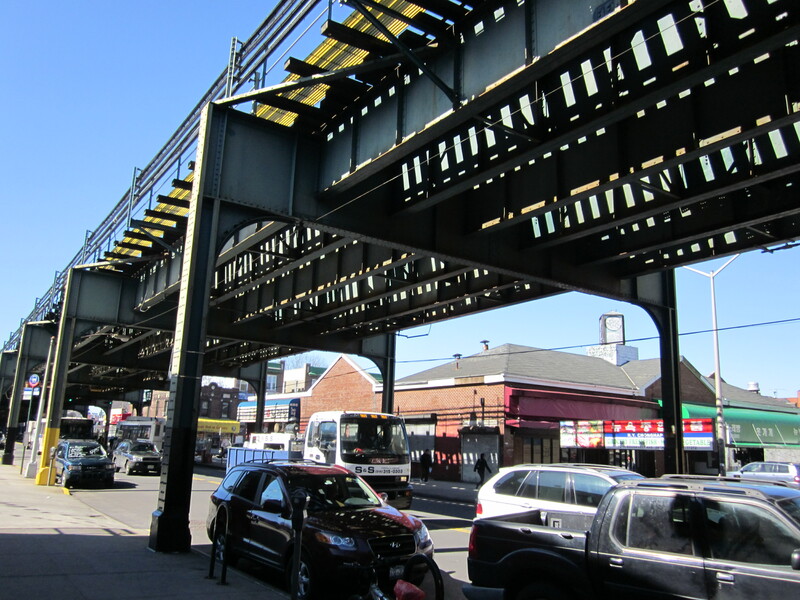 After traveling to Queens numerous times in the almost four years we had been doing this, in 2005, we coined the area under the number 7 train tracks around Roosevelt Avenue and in the environs of Woodside, East Elmhurst and Jackson Heights as the “epicenter” of our Chow City food universe. And it pretty much remains so six years later. Though there was no yak on the menu, there was, however the promise of goat brain and ox tongue. Zio brightened at that prospect but was disappointed when our genial Tibetan waiter quickly informed us with a straight face that they were out of brains and tongue. We would have to settle for more pedestrian fare such as shabaleb, a doughy patty stuffed with a tough slab of ground beef that was pink, almost tartare-like. 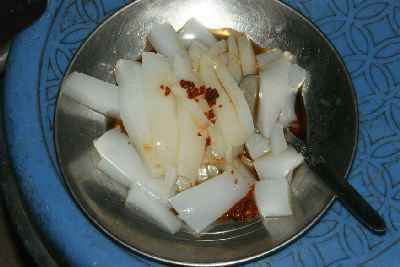 Or the la phing, a cold spicy bean jelly that was tossed with garlic, vinegar and soy sauce that our newest member, Mike from Yonkers took one bite of and, to the dismay of the rest of us, immediately spit out into his napkin and excused himself to run to the bathroom. The la phing and its slime-like consistency certainly had to be an acquired tasted among the Tibetans, but regardless, we expected more temerity from the Tae Kwon Do-trained Mike from Yonkers. The tsel phing, on the other hand, bean thread in a broth with vegetables and two tingmos (Tibetan steamed rolls) was the perfect comforting antidote to the admittedly revolting la phing. One of Yak’s special entrees was the gyuma, ten very dark sausages filled with beef that were so good would they would undoubtedly tempt even a vegan monk. What we sampled from the Nepalese kitchen side of the menu was reminiscent to Indian food. The haku chhwela, roasted pieces of lamb were tender and fragrant with Indian spices, while the achar was similar to aloo gobi, pieces of potato and cauliflower in a thick curry. Both were devoured almost instantaneously by our gluttonous group. Though they do not need worldly pleasures to find fulfillment, Tibetan monks, I had heard, make an exception when it comes to sweets. You wouldn’t know it from what was offered at the Yak. The dey-see, steamed rice with yogurt, raisins and butter had only a hint of sugar and would have made a better breakfast choice than one to follow the likes of ten beef-filled sausages, while the bhatsa markhu, a hand made pasta that reminded Rick of cavetelli with barley, sugar, butter and grated cheese and according to Gerry tasted somewhat like the Jewish dish, kugel, remained practically untouched, a rarity in our insatiable circle. Our feast was accompanied by a pot of buttered and salted Tibetan tea. The creamy, salty tea at first was a shock, but after a few sips grew on all of us. It would have been the perfect beverage for a wind-chilled night in a tent in the mountains. Not so perfect, however, for a muggy September evening with the scent of gasoline from the next door gas station. 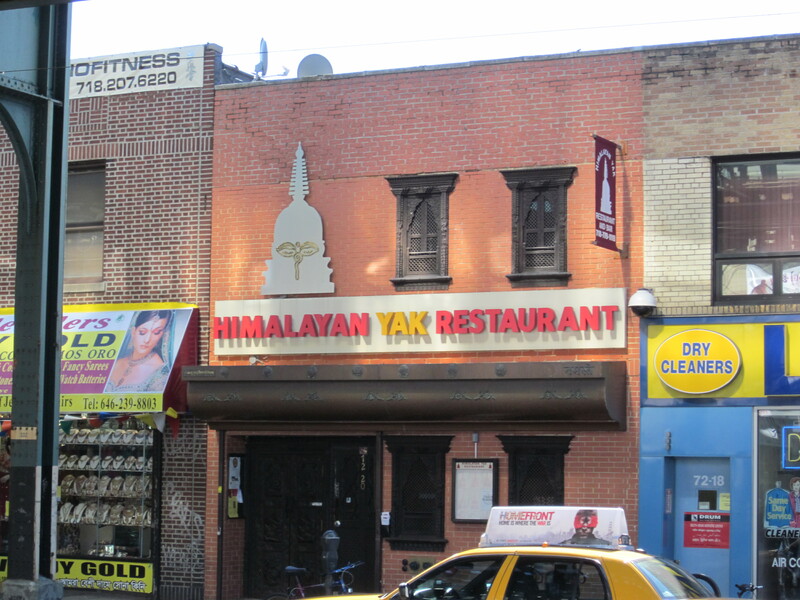 “Good news for all meat lovers,” proclaims a streaming headline on the Himalayan Yak website: www.himalayanyakrestaurant.com. “We now have Yak meat on our menu.” This might be good news for meat lovers, but maybe not so for yaks. 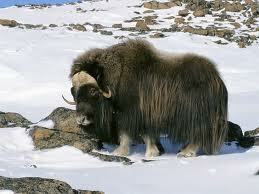 I recently returned to Himalayan Yak for the first time since our 2005 visit and could not find any yak on my menu. Besides the supposed addition of yak meat, the restaurant has blossomed—if you can call it that—by adding three flat panel LCD television screens positioned next to bucolic scenes of Tibet and a Buddhist altar and proudly, as all restaurants do, displaying their well earned blue A from the Department of Health in their window…and on their website. 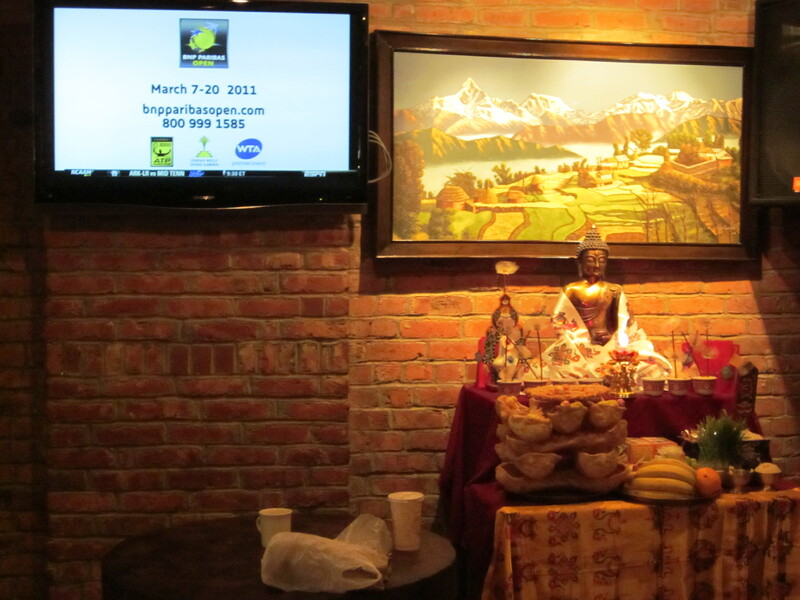 There is also live Tibetan, Hindi, and Nepali music in the now sleek dining room. I confess to never having heard Nepali or Tibetan music but wonder if it’s prominent enough to help drown out the consistent rumbling of the number 7 train just outside Himalayan Yak’s door.